Loctite to make sure the crank bolts dont come back out. I also used it on my waterpump bolts. 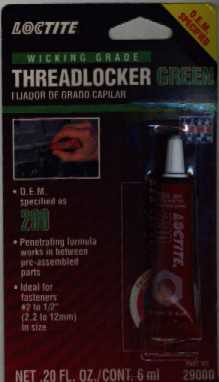 I show the GREEN threadlocker, but I used BLUE instead. It is more appropriate for the install. Go to the parts store and buy a couple belts an inch or two or three smaller than the one you have now...that way you will minimize the trips you make and the number of returns...hint...use cash to pay for all the belts..
First, get your socket and loosen the waterpump bolts, and the crank bolts. Dont loosen them too much, but just enough so that you will be able to remove them without the belt on. I did this because I didnt have access to a Impact Wrench to loosen the Pulley on the Altenator. 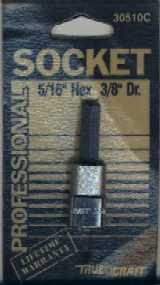 Use the socket to remove the top bolt, then use a socket to remove the bottom bolt. I brought the Altenator to a shop where they quickly removed my pulley and put the new one on. Next, I removed the Crank pulley (dont loosen the center bolt..thats not for the crank pulley), then the bolts holding the fan to the Water Pump pulley which also hold the pulley onto the Water Pump. Carefully seperate the fan off the pulley, and let it rest inside the shroud...dont hit the fan and cause it to bump against the radiator...BE EXTRA CAREFULL BECAUSE YOU CAN DAMAGE THE RADIATOR!!! You may want to put some cardboard in front of the fan before you remove the fan to protect the radiator. Re-install Crank pulley using bolts provided and loctite on all bolts..
Re-install the Water Pump Pulley and fan...tricky to line everything up...but there is a EASY WAY...put the pulley on, then install one bolt two or so turns. Then take the fan, and set one of the notches in the bolt that are on the fan, then slip it so that the shaft goes into the fan...you will understand when you do it...then put the rest of the bolts in all of the way..make sure there is loctite on those bolts...and the one you put in before it. Reapply the belt, and PRESTO! 11mm or a 7/16 for the WP...I couldnt tell which one was best. 69.5" Bypass powersteering, and smog with smog pump removed, same routeing as for stock pullies. 76.0" Bypass smog with Smog still on car, same routing as above on stock pullies. AHHHHH!!!! Currently have no pictures of the install...I took pictures, but the roll got wet...I will bring the roll to a good camera shop to see if they can develop it. Sorry.